Why choose Red Pine??? Red Pine Condominiums is a large complex with approximately 24 buildings nestled below the Canyons Village area of Park City Ski Resort, Utah’s newest and largest. It’s just three miles to the Park City side and Old Town Main Street. Four miles to Deer Valley Ski Resort. Less than an hour to Alta, Snowbird, Solitude, Brighton, Snowbasin and Powder Mountain resorts. Red Pine offers large common green areas, lots of pine trees, plentiful parking and glorious views! Why choose our place??? We take pride in our cozy, non-smoking, two bed, two bath plus loft unit and like to stay there as often as possible. The kitchen and baths have been remodeled with granite counters and hickory cabinets and the condo has been redecorated throughout. It accommodates six people with two king beds (1 upstairs, 1 downstairs and 2 twin beds in the loft room), has a gas fireplace, washer/dryer in the condo and is a fully equipped with everyone needed for a comfortable stay. A gas grill stands ready on the deck, which overlooks our spectacular view of the ski runs. Flat screen televisions with cable in each bedroom and DVD/VCR/stereo w/surround sound in the family room. Fully equipped kitchen, microwave, washer/dryer unit, two bathrooms and three vanities, TVs in each bedroom, games, videos, books, kid toys/stuff, BBQ, gas fireplace, off street parking, clubhouse, pools (heated in winter), sauna, hot tubs, tennis and sand volleyball, close to shuttle stop, walking distance to ski lifts, great view of ski slopes. It’s located within walking distance to the Cabriolet (parking lot gondola) or catch the free shuttle from Red Pine to any of Park City’s ski resorts. The free shuttle will also take you all around Park City for easy shopping, dining and entertainment. The Red Pine clubhouse is located just across the street and has two swimming pools (1 heated in winter), a kiddie pool, two hot tubs (1 inside/1 outdoors), sauna, BBQs, sand volleyball, tennis courts, horseshoes and coin laundry. Incredible mountain biking, hiking, fly fishing, boating, horseback riding, golfing, free outdoor summer concerts, mini golf, alpine slide, zip lines, disc golf, adventure courses, bobsledding-on-wheels, cross-country skiing, ice skating and visiting the Utah Olympic Park to see athletes in action are just some of the many things to do while staying in Park City. Although our home is in Northern California and lots of our winter skiing and boarding is in the Tahoe area, nothing beats the time we spend in Park City, especially at Park City Ski Resort. We were thrilled to get our son making turns on the snow at three years old. He's now a little ripper who enjoys powder days as much as us. Our free time during the summer is spent waterskiing and mountain biking. We always look forward to our summer trips for the outstanding single track riding all over the Park City area, as well as the summer festivals, concerts and events. We hope you'll have the opportunity to experience all that the Park City area has to offer soon! Park City has some of the best mountain biking, hiking and fly fishing around. All these activities in addition to the area's awesome skiing conditions make Park City our favorite place to be. We love Red Pine because of the wide open green (or snow!) areas, plenty of parking at the complex and its convenient location to anything a person might want to do while visiting. We absolutely fell in love with the terrain and attitude of Canyons (Park City) Resort. It continues to improve each season. Our condo is a short 5 minute walk in ski boots down to the Cabriolet to start your ski day. And, our deck has a great view of Canyons Village area and sunsets each night. The free city shuttle is easy to catch for any other destinations. Just pack your bags and arrive. Our condo is fully stocked with just about everything needed for a wonderful getaway. We even have kid stuff (dishes, toys, books, booster seat, potty seat, pack-n-play etc). toilet, combination tub/shower, A separate third vanity w/ sink downstairs. Two full baths with tub and showers. A third sink and vanity helps expedite getting ready with a full condo of guests. Absolutely fantastic skiing, mountain biking and hiking just steps away from our condo. We're located at the base of the Canyons Village side of Park City Ski area. You can see the resort from our balcony and bedroom windows. Old town Park City is 3 miles down the road. Over 100 restaurants and bars along with tons of unique shopping and art galleries await. The free Park City shuttle will drop you in the fun. Canyons golf course opened in 2015. The 13th hole is located just below the Red Pine complex and the other holes and cart paths meander through the immediate area and Canyons Village. Check out the mountains of Canyons Village and the resorts from our deck! Gas fireplace in family room and wall heaters in each room. Good quality linens provided throughout the condo. Stacking washer and dryer in condo. Also, coin laundry facilities are available in clubhouse. Gas fireplace that keeps the condo toasty warm. Also wall heaters in each room. Bath towels for all guests and pool towels in the condo. We send the information to access our internet in the directions email. The clubhouse also has wifi and a comfortable lobby for relaxing computer use. with ice maker in freezer compartment. Two coffee makers and a Keurig coffee machine for those who like K-cups! A 4-slice toaster and a toaster oven in the pantry. All utensils you'll need for cooking comfortably. Crockpot and BBQ. Just added a Keurig coffee machine. Just bring your favorite K-cups and enjoy. Help yourself to the spices and pantry staples. Cable TVs in both bedrooms and family room. Legos, and miscellaneous toys and a variety of games (kids and adults!). Something for everyone. A variety of DVDs and videos guests are welcome to watch during their stay. Relax in a patio chair and enjoy our great view of Canyons Ski slopes from our balcony deck! Entry is on second floor. Steps required for entry. (3) The lower pool is heated during winter. One pool is designated as adults only during summer. Also, a small kiddie pool during summer. Our condo is fully stocked with cooking and baking equipment, 2 hair dryers, pool towels, throw blankets, videos, toys, books, magazines, brochures for area activities, a pack n play, gas grill, deck chairs, etc. We want you to be comfortable and relax in our condo! Perfect location. Easy walk to lifts and shuttle into town. Perfectly maintained condo that is super clean, homey and well-stocked. Mattresses are very comfortable (and we are very particular on that issue). If you plan to cook at home rather than eat out, which we often do, you will find everything you need to prepare meals. Host is very responsive. We would definitely rent here again and recommend to friends. Nice Red Pine unit. Well stocked with kitchen supplies. Great condition and well decorated. Beds very comfortable. Close to club house. The condo is in excellent condition. It was well appointed, quiet and all appliances in good working condition. Location was a short drive to Cabriolet lift, some people even walked. Overall, a great choice for our ski vacation. We stayed here for presidents weekend and beyond. Tons of snow. Fab. Skiing. Condo was well equipped with kitchen needs. Used the unit’s crock pot multiple times for meals at “home.” Beds were comfortable with nice bedding. The open loft concept of the unit was not a problem for us since we all had the same sleep/wake hours. We drove to the cabriolet parking lot for skiing but many of us walked back in the afternoon many days and it worked out fine. Loved having lots of kitchen trash bags, dishwashing soap and cleaning supplies. The washing machine worked great for us. The club was a very short walk thru the parking lot. The pool and hot tub were hot and clean. Loved the sauna and the management there was very friendly. I would definitely stay here again when looking for an affordable ski option for family or adult friend ski getaway. Would not recommend for 2 or 3 couple’s getaway due to privacy issues. 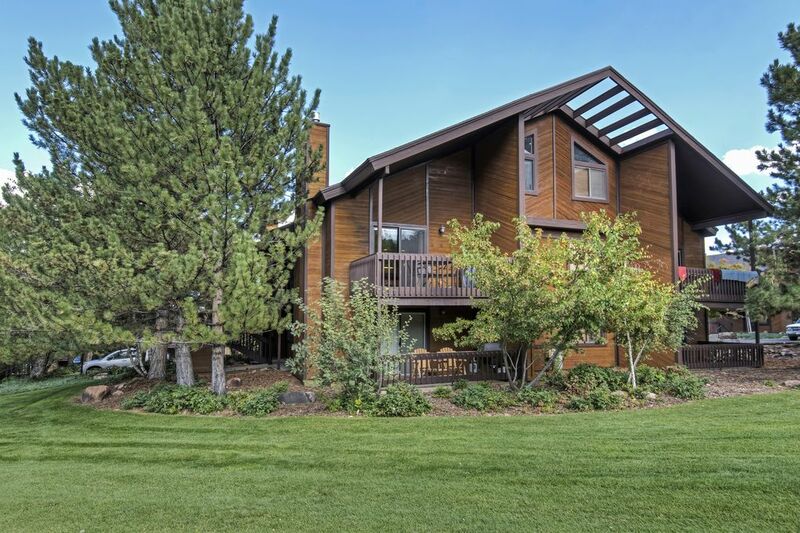 The property was exactly as described and in a great location in the Red Pine Condos. Nice and close to walk to the jacuzzi after a long day on the slopes as well. Plenty of room for 2 couples and we enjoyed relaxing on the couch in front of the fireplace. Beds were comfortable and there were even 2 more twin beds in the loft that we didn't use. Would definitely consider going back. Owner was great to work with as well. Glad our condo met your needs. Thanks for taking the time to share feedback. Our condo is located at the base of Canyons Village area of the Park City Ski Resort, Utah's largest and newest resort. Now owned by Vail, the resort area continues to expand with more dining, shopping and spa options. A Golden Door spa is located within the Waldorf Astoria, a short walk from our doorstep. The long awaited Canyons golf course that wraps Canyons Village and below Red Pine Condo complex opened in 2015 and continues to draw a golfing crowd. The clubhouse adjacent to our condo boosts three swimming pools (one heated in winter), an indoor hot tub, an outdoor hot tub, indoor sauna, tennis courts, volleyball courts, horse shoe pits and BBQs with picnic facilities to enhance your stay. Shopping, dining is located above our condo in Canyons Village as well as three miles either direction from the condo. Start your mountain bike ride or hike from just outside the condo. Visit the Utah Olympic Park for adventure courses, zip lining, tobaggon or luge rides, watch the athletes practice freestyle jumping into the pool during summer or the investigate the history of the 2002 Olympics year-round. $150-245 night 50% deposit at time of booking with balance due 30 days prior to arrival.